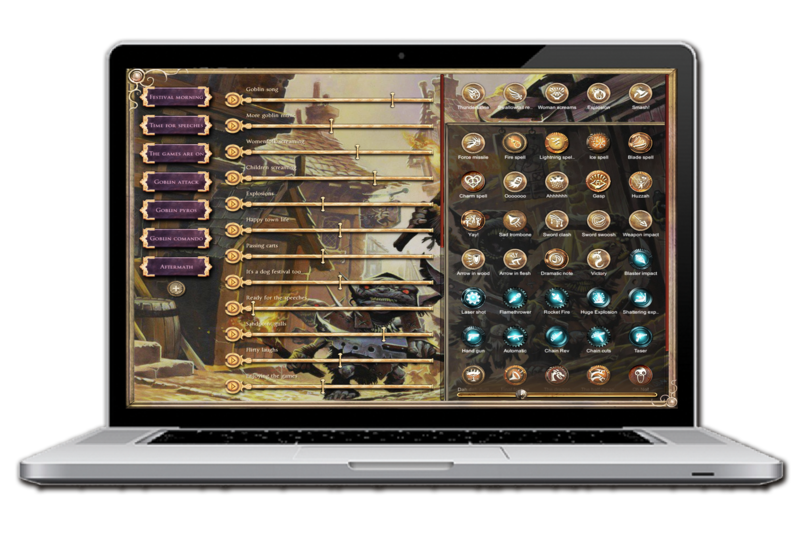 Syrinscape is an app that brings beautiful, immersive, dynamic sound effects and music to tabletop games. 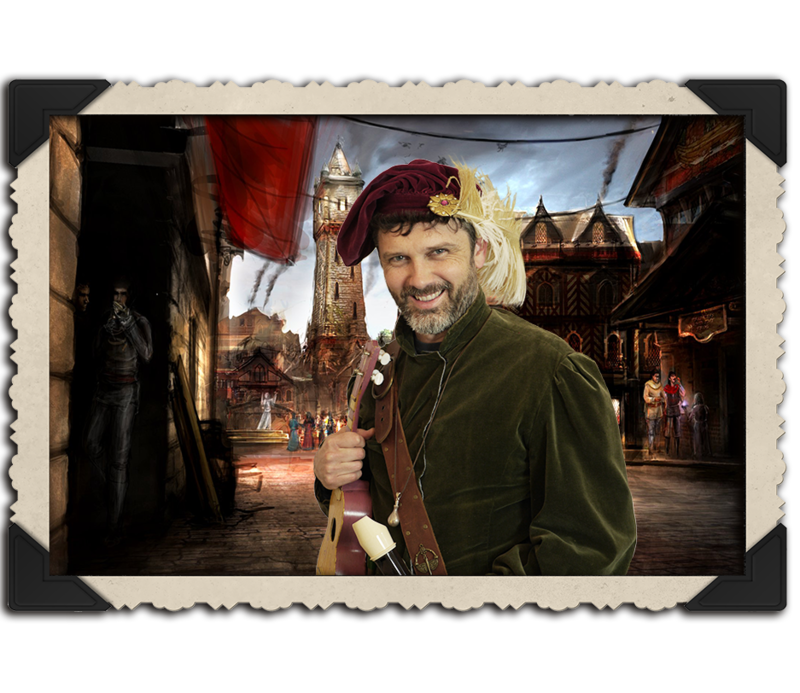 What is the Syrinscape Online Player? 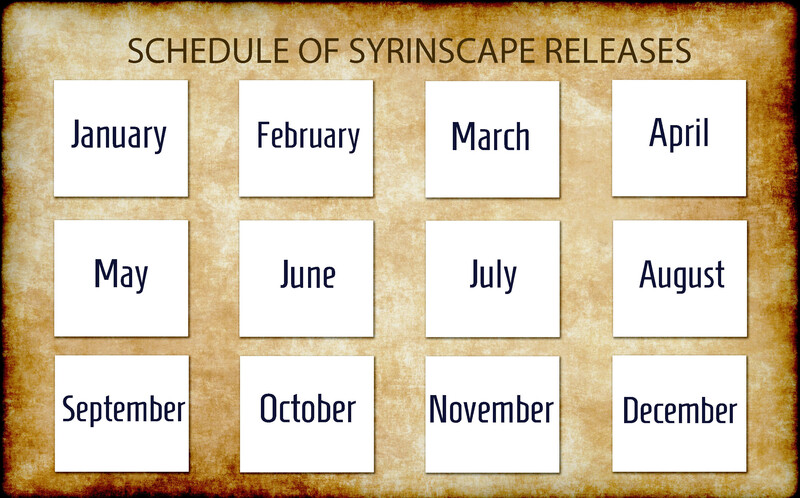 Broadcast the sounds of your RPG to all of your players, anywhere in the world with the Syrinscape Online Player! 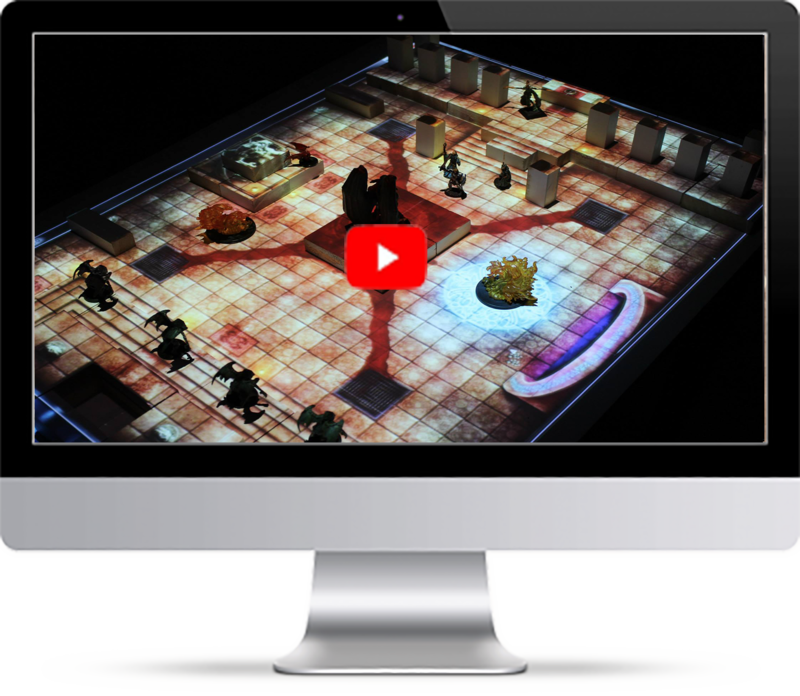 Compatible with Roll20, D20Pro, Fantasy Grounds, or any virtual tabletop, the Syrinscape Online Player is a killer solution for routing your Syrinscape sounds with no latency and no loss of quality, creating immersion and engagement for your players. 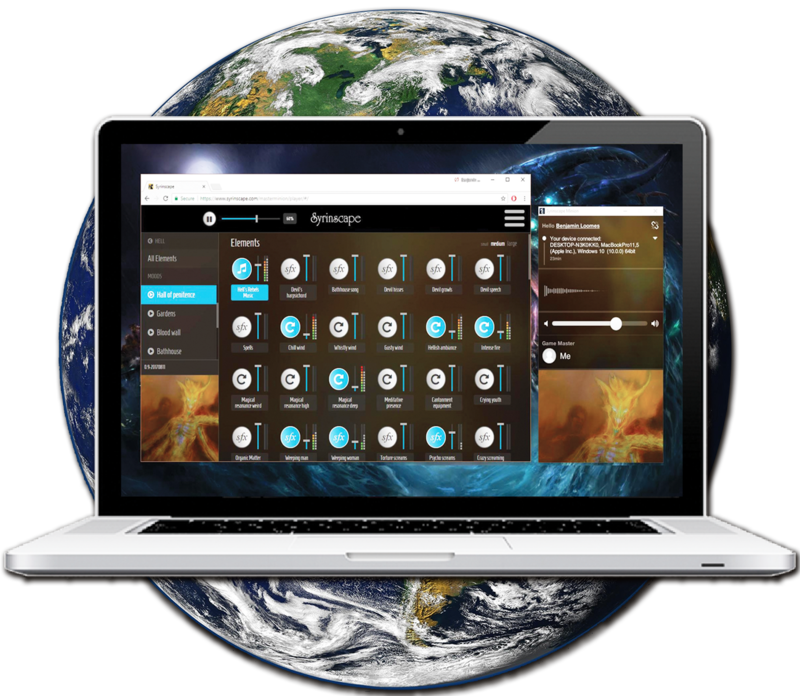 With the Syrinscape Online Player, GMs can control Syrinscape in any browser and send sounds to an unlimited number of speakers, anywhere in the galaxy, in perfect sync and full-quality. The best news is that it is FREE for all our SuperSyrins, so subscribe today and be transported anywhere in the multiverse. What is the Syrinscape SoundSet Creator? The Syrinscape SoundSet Creator is a simple to use, yet in-depth sound toolset, which gives you the power to create and customise your own fantastic sound environments. The Syrinscape SoundSet Creator is an easy to use sound design app, which gives you the power to create and customize your own sound environments, soundscapes and music. 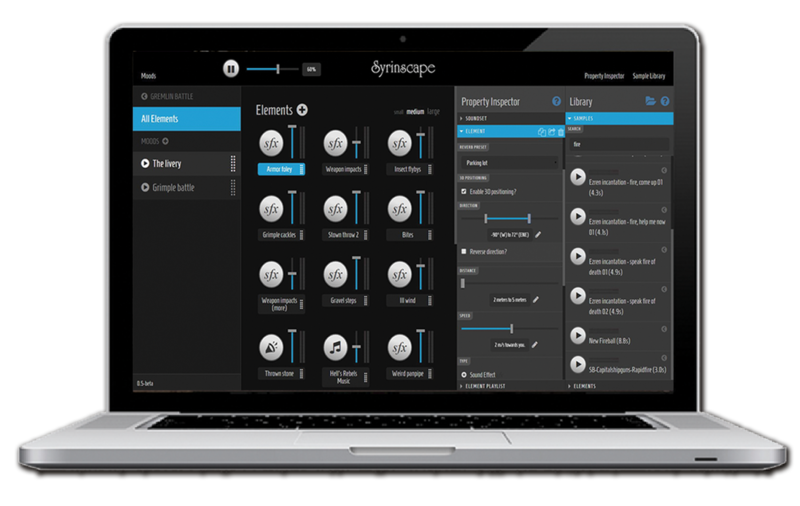 It’s a massively powerful sound-design tool that includes all of the dials, sliders, parameters, and other functions that you'll need to make Syrinscape sound great. Syrinscape SoundSet Creator will bring your library of sound effects to life using Syrinscape's powerful audio engine. The Syrinscape SoundSet Creator is available via the SuperSyrin Subscription, so once you've got yourself a sub, simply log into the website and you'll find the download links at the top right of your screen. The entire Syrinscape library of thousands of sounds comes unlocked with your SuperSyrin Subscription direct into the SoundSet Creator. Experiment with and manipulate every sound the Syrinscape team have built for you. Even better, add your own recordings for a custom sound experience. The SoundSet Creator allows you to create your own entirely unique soundworld from scratch! Here are just a few ways to use the limitless creativity of the SoundSet Creator: Don’t like the rollicking jigs being played in Syrinscape’s Tavern Brawl SoundSet? Customize the music to your tastes! Turn it into a Heavy Metal tavern, or an Irish pub - it’s up to you. Make a custom monster SoundSet with your best roars and howls! Create custom sounds to accompany your favorite tabletop game! Experiment with homemade sound effects with a professional tool that provides incredible intensity, control and immersion. Make some noise! Once your sound masterpiece is complete, you can upload your new shiny SoundSet to our server and sync it across all your devices, and play it like any other normal Syrinscape SoundSet. Then if your SoundSet is great (and doesn't break anyone's copyright), you'll be able to share it with the whole Creator community. All SuperSyrins will have access to all the great stuff that people make. That'll really see our SoundSet libraries grow! Here's a Playlist of detailed SoundSet Creator Tutorials, covering everything you need to know, from SoundSets to Samples! 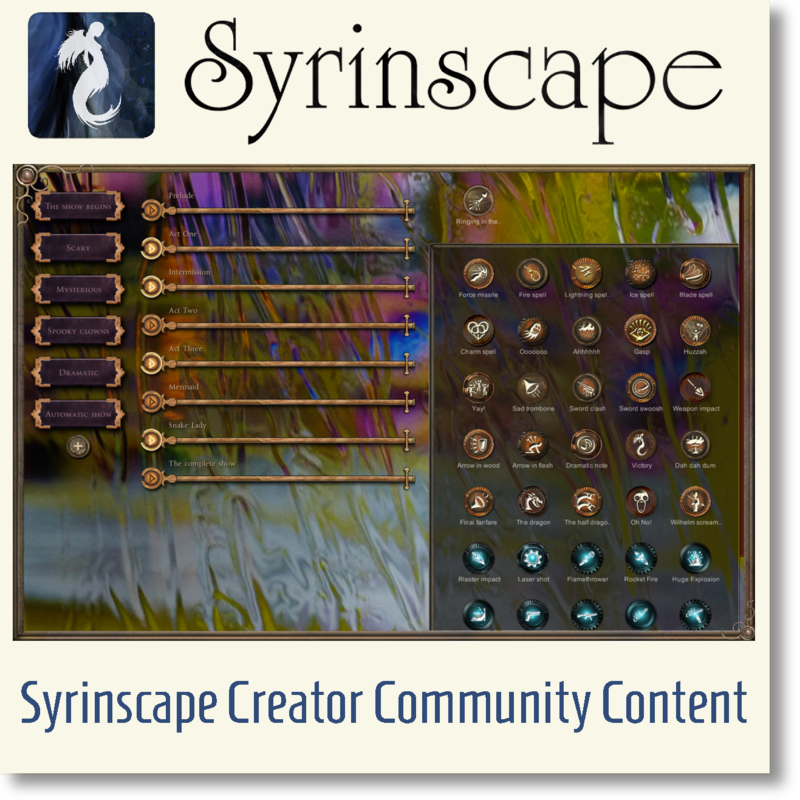 Syrinscape has an amazing community of creators. Find out what new worlds they have dreamt up. The SoundSet Creator gives you the power to create and customize your own sound environments, soundscapes and music. It's massively powerful sound-design tool that includes all of the dials, sliders, parameters, and other functions that you'll ever need to create your very own SoundSet. Once you've finished your masterpiece in the SoundSet Creator you can upload it to our server and sync it to all your devices and play it like any normal Syrinscape SoundSet. Then, if your SoundSet is GREAT and doesn't break anyone's copyright, we may share it with the whole SuperSyrin Creator community. Our library of Community Content is available to all SuperSyrin Subscribers. How to set up Syrinscape? Learn how Ben sets up his sound system to best show off Syrinscape to your Players!! 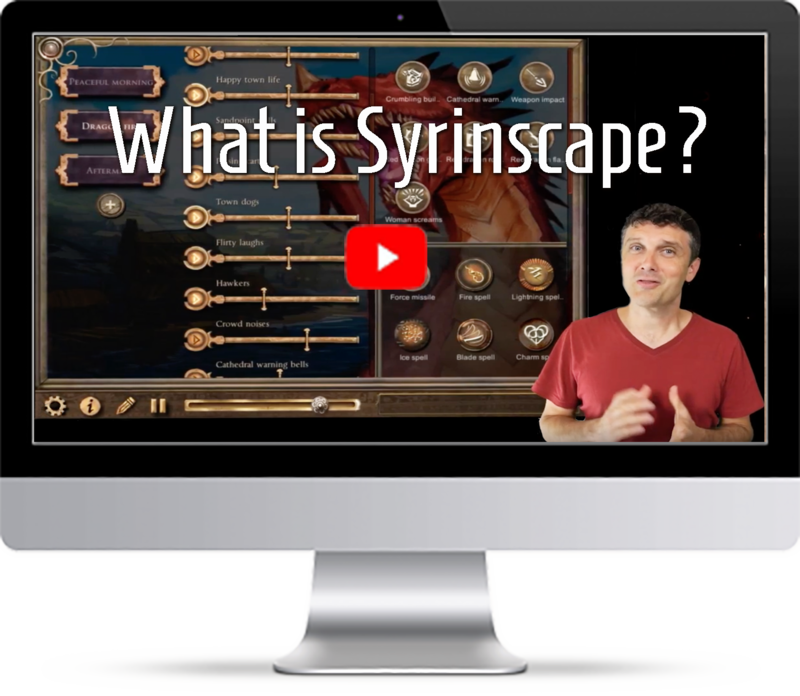 Syrinscape is a revolutionary sound design app that adds evocative, immersive, ambient background sound and a movie-like sound track to your tabletop RPG gaming experience. Syrinscape conjures every aural landscape imaginable, from ethereal forests and stony shorelines to dank vermin-filled dungeons and the spooky depths of the underdark. You can use the tiny speakers of your PC, Mac or tablet - but to get the best out of Syrinscape you definitely should think about using external speakers. Firstly, you can plug or Bluetooth into a small portable sound system or mini speaker. If you are out and about you might like to use one that is rechargeable, or even a set of small speakers chained together like a set of JBL Extremes. This can be very useful if you are playing in an environment where you don't want to be noisy for people at neighbouring tables (such as a gaming store). Keep the speakers soft and close to each player. For some more seriously EPIC sounds you can connect via HDMI from your PC or Mac to a surround sound system allowing you to play Syrinscape in full 7.1 surround sound (find the surround settings by clicking the little cog on the bottom left of Syrinscape! Then you can really scare your players with some big bassy bangs and crashes!! Syrinscape is the brainchild of Benjamin Loomes, über-creative musician, composer and most importantly, passionate tabletop role-player. Benjamin’s passion for tabletop games began decades ago when, as a 10 year old, he was given the 1st Edition Dungeons and Dragons Redbox. Benjamin enthusiastically embraces all styles of tabletop roleplaying, including everything from 5th Edition D&D, D6 Star Wars, Pathfinder, Starfinder, to Call of Cthulhu, Cowboy games such as Boothill and most recently Paranoia. Check out the Dicestormers' liveplay action on Benjamin's Youtube Channel. Here you will find him playing a host of different characters, including his favourite, Thobias, a corpulent, slightly socially inept cleric, who can’t decide which he loves more, bread or wine. Benjamin is a pianist, singer and composer, having studied under prominent Australian composers Peter Sculthorpe, Anne Boyd and Ross Edwards at the University of Sydney. He has composed a large number of instrumental and vocal works, including two operas which premiered in Sydney, Australia. Much of the music and sound design unique to Syrinscape has been created and composed by Benjamin. Benjamin’s unique creative talent, combined with his love of social gaming has driven him to build something which is changing people's gaming experience. The evocative moods of Syrinscape, from friendly taverns to dungeon depths, help to immerse players in the moment. Just where he wants them to be. I want more people to play the Social Games I enjoy. I want people to enjoy these games more, be immersed more, moved more, thrilled more. I want to make Social Gaming a better experience for all those who are brave enough to play. That’s why I created Syrinscape. Here's how we prepare Syrinscape for an immersive, super fun Pathfinder game! Ben joins staff at the Paizo Office in Seattle for an Epic game of Pathfinder with Epic sound from Syrinscape. Players include: Ben Loomes, John Compton, Erik Mona, Amanda Hamon Kunz and Wes Schneider. All playing at level 7.